Hiring a bathroom contractor can be daunting. You want someone who will realize your vision, make the right decisions, show up when they promise, and deliver on time and in budget. They should be someone you can trust, and whose workmanship will create a bathroom you’re proud of for years to come. But you’ve heard the horror stories – contractors who overpromise and underdeliver, who bully you into compromising what you want, and who even take your money and disappear. MrSteam offers the following tips so you’ll recognize the red flags and avoid hiring that terrible contractor in the first place. Watch out for any contractor who rings your doorbell because “they were just in the neighborhood.” Any legitimate contractor is too busy working to solicit work. Even those you ask for a quote may use high pressure sales tactics to get you to sign immediately. They may bad mouth the competition or offer you limited time discounts. Be suspicious of anyone who pressures you to make a quick decision. Beware the contractor who refuses to breakdown his costs and gives you an all-encompassing number for the project. Anyone who provides a quote on the spot hasn’t given the project proper consideration. In addition, contractors who substantially underbid the competition – because you should be getting competitive bids – or who over promise for the same cost is probably too good to be true. 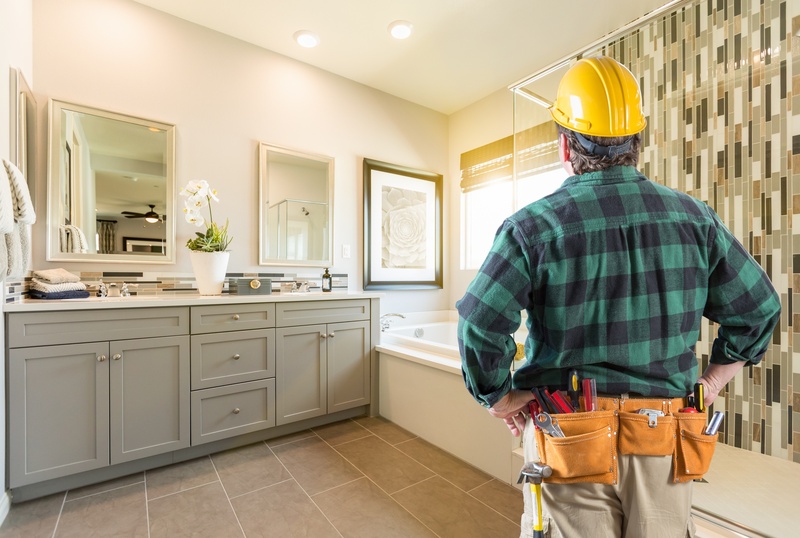 You’re planning to renovate your bathroom- not another room in the house – and that takes certain skills and the ability to coordinate the work of specific professionals. So turn away anyone without bathroom experience. Of course, there’s always the possibility that your contractor is just starting out. If so, he or she still should have worked as an apprentice or assistant to a recognized professional with a bathroom portfolio. Accidents happen, so your contractor and workers need to be protected – and that is the contractor’s responsibility. And she must show the appropriate credentials to operate legally, including licenses and registrations. Beware the contractor who insists that you apply for permits – and especially if they try to convince you that permits are not necessary. An experienced contractor knows the ins and outs of applying for and receiving a permit. Building officials can shut down an unpermitted job – and the official inspection is the only way you know the job has been done right. Run, don’t walk, if the contractor demands money upfront. You may be hiring a swindler who will take your money and disappear. Generally you should be billed only after all work stages are complete – except if a deposit is required for specifics like custom-made cabinets. If so, insist on receipts! Maybe the contractor is just wrong for you. If he shows up late or blows off meetings, ridicules your ideas, tries to bully you into changing your design, or won’t answer your questions – you probably want to look elsewhere. If something feels “off” about the contractor, trust your gut and don’t hire him or her. It’s important that you check the contractor out thoroughly. Professionals should have a web presence and online reviews that you can use to vet them. Ask for specific references – making sure they are current – and go in person to check out recent work on bathroom projects similar to yours. Ask the homeowners probing questions about how the project really went. Of course, if you want a contractor to install a steam shower or any other MrSteam products, you want to work with someone with that experience or the ability to do so. Check with your local dealers who can recommend qualified contractors for the job. But what if you’ve made the mistake of hiring the wrong contractor? Stay tuned, as in the upcoming weeks we’ll talk about what to do about recognizing and dealing with bad contractors in a future post. Have a question for a Specialist? Copyright © 2018 MrSteam All rights reserved. The contents of all material available on this Internet site are copyrighted by Sussman-Automatic Corporation unless otherwise indicated. All rights are reserved by Sussman-Automatic Corporation, and content may not be reproduced, downloaded, disseminated, published, or transferred in any form or by any means, except with the prior written permission of Mr.Steam, or as indicated below. Copyright infringement is a violation of federal law subject to criminal and civil penalties.